Welcome to my psychic services website, offering psychic phone readings now. Readings by email, telephone or face to face. Evening telephone readings must be booked in advance. Accurate psychic predictions, through online psychic readings. Psychic phone readings are available for 20, 40, and 60-minute duration, days and evenings, 7 days a week. I do not cut you off when your time is reached. We will end the reading when we are both comfortable that the reading is over. 01333 313351 Click on the arrow, Scroll down for All Prices and highlight your choice. My aim is to help others to find the correct pathway in their lives and give upliftment and hope for the future. Please check out my credentials and feedback before you proceed. Mediumship readings have to be booked in advance because I have to tune in with the higher power and meditate with my spirit guides and helpers before I start your reading. Mediumship is different to psychic predictions which can be done quicker. 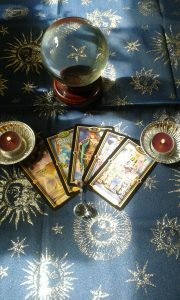 Psychic predictions with tarot and clairvoyance are available without an appointment at any time. For Love and Relationships, Work, Finances, Family and Friendship issues. A psychic phone reading now or same day email reading may be just the ticket for you. Same Day Email Readings are available up to 9 pm daily if you want a same day or evening reply. After 9 pm you can expect your email answers the next day. This is a very popular service and as with all my readings, my clients come back month after month and year after year. Please go to the Same Day Email page for more details. Please Sign My Cats Deaths on the Road Petition Accurate psychic readings by telephone 01333 313351 for readings and enquiries, for email readings then please see the email page. Disclaimer: All readings are for entertainment purposes only and I will not be held liable.